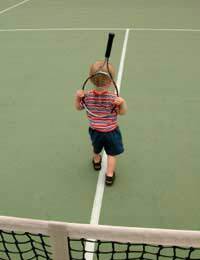 What better way to ensure your children stay healthy and happy than racket sports? And these days it couldn’t be easier in the UK to get them involved from an early age in activities that they can enjoy for the rest of their lives. The national associations charged with administering tennis badminton and squash are all involved in the organisation of these “mini” schemes, which take place in a variety of venues, from schools and leisure centres to public parks. So let’s take a look at what’s in store for junior when he or she first picks up a racket. The Lawn Tennis Association along with sponsor Ariel runs a programme designed for under 10s where technical progression is indicated by a system of red, orange and green colour-coded stages, with corresponding increases in court size, racket length and ball speed. LTA-licensed coaches oversee the activities that aim to offer fun, competition and social interaction. Help and support is also offered to teachers who want to get involved. Badminton England is involved in delivering a first taste of the sport to children aged 4-16 through the Badminton in Schools Initiative (Bisi). Activity cards as well as specially designed rackets and shuttles are available to provide a grounding in skills and tactics that children can utilise as they grow and develop in the sport. Booklets and posters are also available. England Squash has endorsed the Unsquashable Mini Squash programme that utilises specialised equipment to allow children the experience of participating in the sport at an approved centre. This can be a school, leisure centre or squash club, but it must fulfil the strict assessment criteria. Like its equivalent in tennis, the programme is designed around three colour-coded stages, each based around a different ball to develop technique and tactical awareness. There is also an awards scheme. It is reassuring for parents to know that health and safety measures along with child protection guidelines underpin these schemes. It is also important that they realise the benefits of participation for their children. Not least, it’s a lot more fun that sitting in front of the television, or spending days off wrestling with a computer games console. It will keep them fit while providing all the excitement they could possibly want. As their child grows and develops their skills, for example, it provides another arena in which they can bond with their child, either through challenging them on court or watching their progress through the ranks of school and county competition. Among the benefits of the whole family getting involved is the chance for mum or dad to lose a few extra inches from around their waists while having fun with their children. One rule of racket sports that the children will quickly learn is to always ensure that mum or dad wins. Well, at least while they are still in charge of distributing the pocket money.